PLANS to build a tip on Tomerong’s outskirts have been rejected by Shoalhaven City Council. 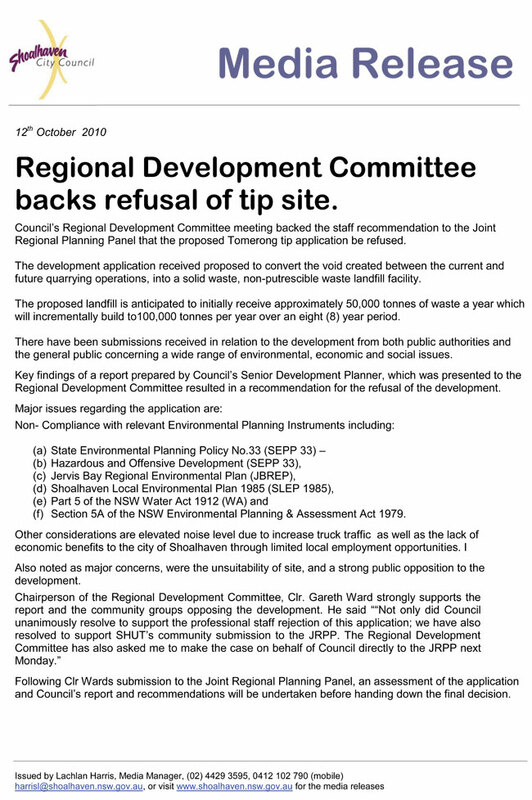 A report recommending the tip application be refused has been completed by council staff, with the report to go to the Joint Regional Planning Panel. It will consider the matter at its meeting on October 21. The recommendation from council staff has been hailed as “fantastic news” among members of anti-tip action group Shoalhaven’s Unwanted Tip (ShUT). “Obviously we’re delighted with the news,” said ShUT vice-chairman, John Levett. However he said people should not be celebrating yet. “The decision is obviously with the panel, so let’s just hope the panel notes the council’s concerns, and also the community’s concerns,” Mr Levett said. • The proposal does not comply with the requirements of SEPP 33, as there is insufficient information to determine whether the hazardous and offensive components of the development have the potential to pose a significant risk and adverse impact in the environmentally sensitive locality. • The application is considered to be unacceptable and does not comply with some sections of the Jervis Bay Regional Environmental Plan. 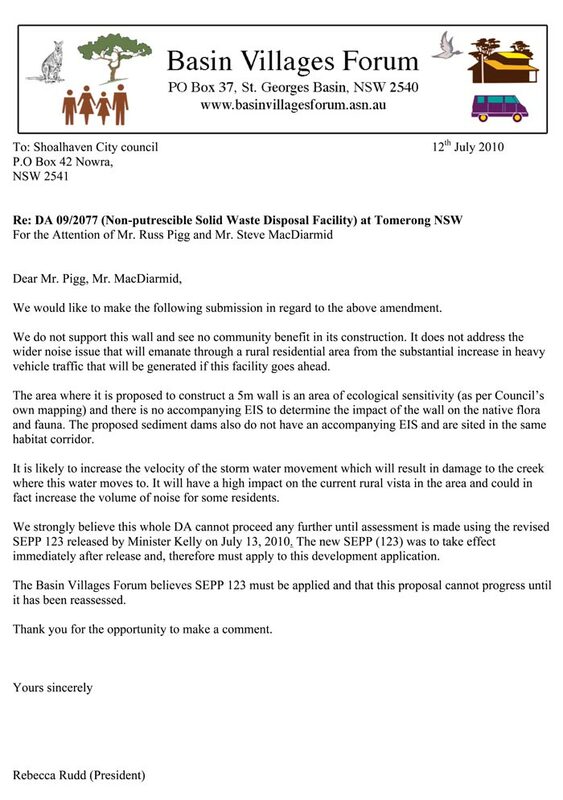 • The application is unacceptable, as there is insufficient detail to determine impact on surface and ground water and the possibility it could pose a significant and adverse impact on the sensitive environs of St Georges Basin and the Jervis Bay Marine Park. • There is insufficient assessment on how threatened species, their populations, ecological communities and/or habitats will be impacted. • The applicant has failed to submit any information detailing how the proponent expects to avoid or mitigate the threat from bush fire. • There will be an unacceptable impact from the intensification of additional truck movements on Gumden Lane and council’s road network. • It is not considered that the proposal is in the public interest. Councillors will meet on Monday evening to consider the staff report and decide whether they want to make separate and additional submissions to the planning panel. ShUT members will also attend the meeting to find out more details of the staff report. Mr Levett said it was important ShUT members obtain copies of the staff report to help frame any additional submissions or representations to the October 21 meeting, which will be open to the public. Any new submissions will add to the huge volume already lodged with council. “There were more than 700 submissions in respect of this application,” said council’s director of development and environmental services, Tim Fletcher. ShUT is calling for urgent help from members and supporters. The fight intensifies - Your submissions to council have been a great help in the campaign against this tip. We are now taking the fight to a new level. Why? - The Department of Environment, Climate Change and Water (DECCW) has given General Terms of Approval for this development to proceed. The Joint Regional Planning Panel (also appointed by State Government) will now make the final determination on whether the Tip gets approval or not. It is now a State Government issue. We need to make the relevant Ministers aware of our objections. For further information go to http://www.shutip.com/ If you are unsure how to submit an objection, a draft letter is on the ShUT website; all you have to do is insert your objections. They have also provided a list of reasons why you can object to this development. · We believe that the supporting documentation from the applicant is flawed, and it is not a sustainable development. · This development application is NOT IN THE PUBLIC INTEREST. It is for a privately run, privately managed facility which will only benefit the proponents. The Shoalhaven will have to put up with all the pitfalls (increased heavy vehicle traffic, noise, air, water pollution). · To place a tip of this size in proximity to a major NSW tourist destination is incomprehensible. The tourist destination is at risk of becoming the trash destination. 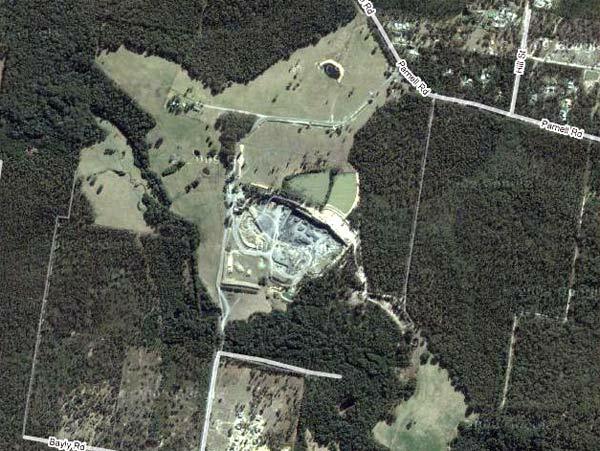 · Six million litres of concentrated industrial waste leachate sitting in a dam, in the headwaters of Jervis Bay and St Georges Basin catchments cannot possibly be considered SAFE. BP thought their oil rig in the Gulf of Mexico was safe too! Is gambling the future of our Bay and Basin justified? The ‘Precautionary Principle’ MUST apply. 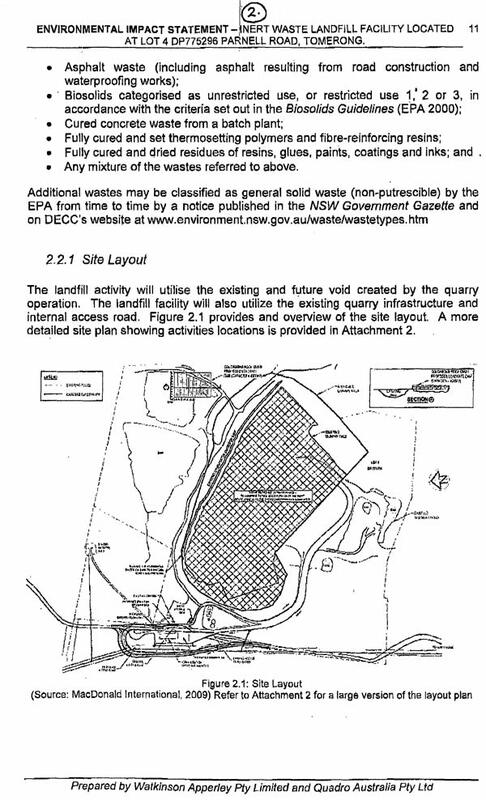 · Only 4.5% of the waste planned to go into this tip will come from the Shoalhaven. The rest will be trucked in over long distances via the Princes Highway (11,500 additional truck movement per year) This proposal is completely contrary to the Principles of Ecologically Sustainable Development and the State Government’s plans to reduce carbon emissions. Waste will not be putrifiable waste, but rather landfill from all other tips in the Southern Councils Group region – Wollongong to Bega – to reclaim space in existing tips throughout the region. Current quarry trucks movements is 8 trucks/hr. The traffic study concludes that another 5 vehicles/hr is insignificant along Island Pt Rd & Gumden Ln. The preferred entrance of Gumden Lane is due to an existing weigh station ideally located in line with this entrance to the quarry . Quarrying activities will NOT cease when the tipping operation commences. Quarrying will continue until the rock source is depleted in several years. 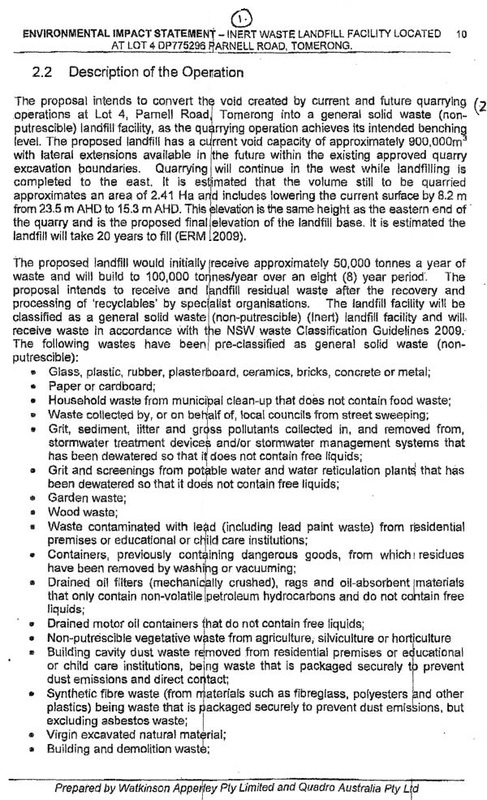 No recycling activities to be conducted on the site (ie. Crushing/grinding etc of waste materials). No public access will be given to the facility. Initially to process 50, 000 tonnes/annum, with an increase to 100,000 tonnes per annum thereafter.